As soon as I started cutting out felt food, I realized I wanted picture/word cards to introduce word recognition to my daughter. My daughter was excited to make the felt food so we cut out the ones she wanted and put them into the flannel board activities box. 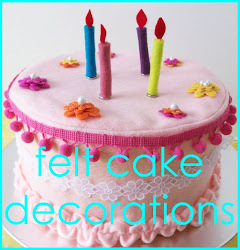 For those with younger children, the felt food is lots of fun so I will show you how to make it at the end. Click on the pictures below to make your food cards. The grid is for you to make your own. I found an outstanding website with free digital images (some require attaching the artist’s name to the image) HERE. I also used pictures from various companies’ websites. I figured they would like the free advertising and I explain why I used these particular images at the end of this post. I also do a lot of my shopping at Costco, so these aren’t very representative of a “normal” person’s shopping list—just mine! Please note that these printables are absolutely for PERSONAL USE ONLY. Do not reproduce them in any way except for this craft. Do not sell them in whole or in part or make items to sell from these printables, in whole or in part. My food cards are sewn as well as bonded with fusible webbing. I figure they are going to get a lot of use and I want them to hold up. If you eat a variety of foods, you will want lots of cards and that takes a while to make—another reason why you do not want to have to make these twice. You can just skip the sewing if you don’t want to do that part. Or, you can just print the cards on cardstock, cut apart and laminate and it will be really fast. The instructions are for sewing and bonding, though. Place your cards on felt about 1/2 inch or more apart and iron to the felt following the manufacturer’s instructions for adhering the iron-on fabric sheets to things. Be sure to use a press cloth over the cards so your iron does not touch the felt—it will melt! I did 9 at a time just because it fit well on my ironing board and on the sewing table. Zig zag stitch around each card. Cut cards apart with about 1/4 inch border around each side. I just eyeballed this amount. On another piece of felt, adhere fusible webbing according to the manufacturer’s directions. Again, be sure to use a press cloth so you don’t melt the felt and guck up your iron. Peel off the paper when cool, but save it! This will be the back side of your food card. Lay each food card on top of the back side felt and cut around it carefully. This helps each card to be the right size without having to be super precise. Stack cards and backs together with each set going in opposite directions so the right pieces stay together. Cut velcro strips (opposite side of velcro as what is sewn into the book for shelves) into mini-strips. I wanted this to be a little bigger than a square so it is easier to find the other side of the velcro and it will stick quickly. Sew in the center of each backing piece with the fusible side being on the bottom or back side of your sewing. Put each finished back piece with the front piece and stack in opposite directions again. Place each set face down on top of one of the papers from the fusible webbing. Place another paper over the top (or a press cloth if you don’t have another one) and press firmly to fuse the front and back of each card together. I did two cards at a time. Sew around each card with a straight stitch. I sewed about 1/8 inch from the edge. This is when the imprecise measurements show up really well, but it didn’t bother me (surprisingly!) and I am sure it won’t bother your child! That’s it! It isn’t hard, but it does take some time, especially if you have a lot of cards. *The picture should match the word—if you have one banana, it should say “banana” not “bananas” and vice versa. *Use a font that is clear and readable for beginning readers. This isn’t the project for cutesy fonts if you are concerned about the educational value. I used LuzSans-Book which is my favorite kid-friendly font. It looks like very clear, elementary printing. Times New Roman is also a good one because it is the font or similar to the font used in many books. *Use the word your child uses for certain objects not necessarily the correct word (although I would stay away from silly or made up types of words like “nanas” instead of “bananas”). My daughter calls all pasta “noodles.” Had I written “pasta” on this card, she would have seen a box of noodles and said "noodles” while repeatedly seeing a word that doesn’t match that. I do not want to reinforce that. So, I wrote the word she uses and it makes sense. I want to reinforce the word that she is saying with the word that she is seeing which is a correct, though not specific, word for this item. 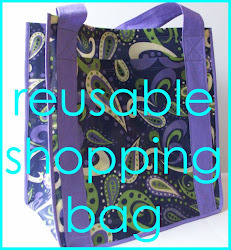 *Finally, I used the same brands that I buy when I used a picture of an item in a package. This is because my daughter recognizes these items. An example…She loves marshmallows and even as she ran past the computer on the way in from playing the day I was making the printables, she caught the marshmallow picture and stopped while she said, “Marshmallows! Mommy, can I have some marshmallows like those?” as she pointed to the screen. If your child already immediately recognizes the pictures, he or she is more likely to spend some brainpower on seeing the word. Every time that word is associated with the actual item, there is a greater chance that the brain is actually learning that word and will recognize it in other contexts. And, that, my friends, is reading! The food cut outs are made in a similar way to the food cards. I cut out the front and back separately so I could sew the velcro on without it showing through to the front. If that doesn’t bother you, you could do this even faster and more efficiently by fusing first, cutting out both shape (front and back) at the same time and then doing the sewing. Iron on fusible webbing to another piece of felt according to the manufacturer’s directions. Leave the paper on and let cool. Lay the food shape face down on paper and trace around it. Cut out the food shape. Peel off paper backing. Sew on velcro strip. Again, make it longer so it will be easier to attach to the book. Put the two pieces together and iron to fuse them together. 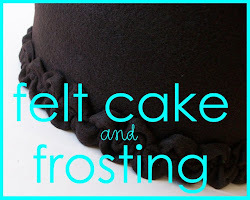 Be sure to use a press cloth or the paper backing so you don’t melt the felt. Now, go shopping! It should be entertaining instead of cRaZy! Great idea! I would never have thought to include my kids in the list! I definately need to make one- thanks for the tutorial! Even though I do not have little ones at home I sure loved this tutorial on how to make food cards. So clever and full of wonderful tips. Tammy, I love this! What a lucky little girl you have. She must love going shopping with you. This is such a wonderful craft - always looking for something to keep the kiddos busy when grocery shopping. Hi, the pictures you use are similar to a comunication system widely used by children with Autism. If you look up "PECS" (Picture Exchange Communication System) you will find tons of photo-realistic pictures of any number of things, from foods and games to activities and places. All premade and easy to download. One tip however, I would search for "PECS Autism" or your results will include alot of pictures of steroided-out body builders! Learned that. Tammy, I absolutely love this! I have been out of town or would have commented sooner. This is such an amazing craft. I love EVERYTHING about it! Once again, you never disappoint. Everything you do is so awesome! LOVE it! This is a fantastic way to include the kids in grocery shopping. Thanks! Hi! Do you mind sending me the LuzSans-Book font? Couldn't find it anywhere on the web but I'm desperate for it! It looks really compatible with the food cards you've made. Good luck--enjoy your shopping book! I love this idea and thank you so much for including the pictures. I have no time to search those all out on my own. I am making two of these asap for my girls (a slightly modified version but same idea). 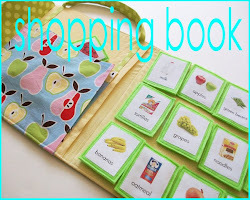 Love the shopping bag book and especially the word cards! Thank you for sharing the tutorial! I just finished printing my word/picture cards, but I used print iron-on transfers and the directions say to flip the image before printing and place the picture side down to iron. Ack! What do I do now? Can you share a link to the iron-ons you used? Can you explain the purpose of the fusible web on the backs and in between items? Can"t I just sew them together? I'm assuming you are talking about the cards. You can definitely just sew the cards together without the fusible web. I like the way everything was held in place while I sewed it on. I was also a little concerned about the felt stretching out over time as the card is repeatedly pulled off and on by the velcro, but I don't think the webbing is essential by any means. I just wanted my cards to be super strong and the fusible web made them a bit stiffer as well. Thank you so much! This is an awesome guide. My original search was for pictures I could laminate for my 4 year old to help me shop but now I am going to make the fabric book for my 2 1/2 year old and one with the felt pictures for the baby when she grows up. Thanks! Thank you so much. I printed and laminated these (and made a stack of my own using your template). I then printed out recipe cards with the name of the recipe and a picture of the finished meal. I used the blank grid and typed in the word for each ingredient used in the recipe in each grid section. We now play cooking as a word recognition game where each ingredient is placed over the matching word on the recipe card.